Concordia’s diverse fee levy groups—17 in total, from CJLO and the People’s Potato, to Cinema Politica and the Sustainability Action Fund—have been subject to many debates recently in Concordia Student Union meetings, in the pages of The Link, in our university hallways and elsewhere. These debates will continue into the upcoming CSU election period, due to a proposed referendum question that, if passed, will devastate the ability of fee levy groups to effectively function on campus. On one level, the debates are really healthy and useful, because they raise awareness about the incredible diversity of services, campaigns and events that fee levy groups are responsible for, and the active involvement of students as board members, employees and volunteers. As active supporters of fee levy groups—between the two of us we are board members, employees and users of these groups’ services—we always welcome having a forum to promote work by and for students. We all work as hard as we can within our limited capacities to do the best outreach for our groups as possible, and these debates have only motivated us to work even harder. But what’s most unfortunate in the current debate is that many people arguing to undermine the funding of fee levy groups—by allowing per-faculty referenda instead of united student referenda—have falsely divided students and threatened the principles of student democracy. One main argument against fee-levy groups is the appeal to the pocketbooks of students, highlighting student poverty and instability, which are very real issues. However, many fee levy groups directly organize against student poverty as part of their ongoing campaigns and services. For example, the People’s Potato began operating in response to student hunger and poverty more than a decade ago, and the Co-op Bookstore exists to provide affordable textbooks. What the proposed referendum question against fee levy groups does is turn student against student in a fight for pennies instead of uniting students together to get back important dollars in university funding, lower tuition and better services, and in providing students with cheaper public transportation, rent, on-campus childcare and more. The whole point of a student union is that we’re more effective together in dealing with any number of issues that students care about universally, from campus sustainability to student poverty to ensuring a quality learning institution. Fee levy groups are on the frontlines at Concordia in working on all those issues, so it’s particularly troubling that their funding base would be so directly attacked. Another argument by the proponents of anti-fee levy referendum questions is that students from the John Molson School of Business in particular are somehow distant or removed from fee levy groups, but the reality is that JMSB students play active roles in the running of fee levy organizations. A quick survey of fee levy groups shows that within the last three years, JMSB students have been board members or staffers at Art Matters, the Centre for Gender Advocacy, CUTV, the Community Solidarity Co-op Bookstore, Concordia Volunteer Abroad Program, The Concordian, QPIRG-Concordia, the Sustainability Action Fund and Sustainable Concordia. 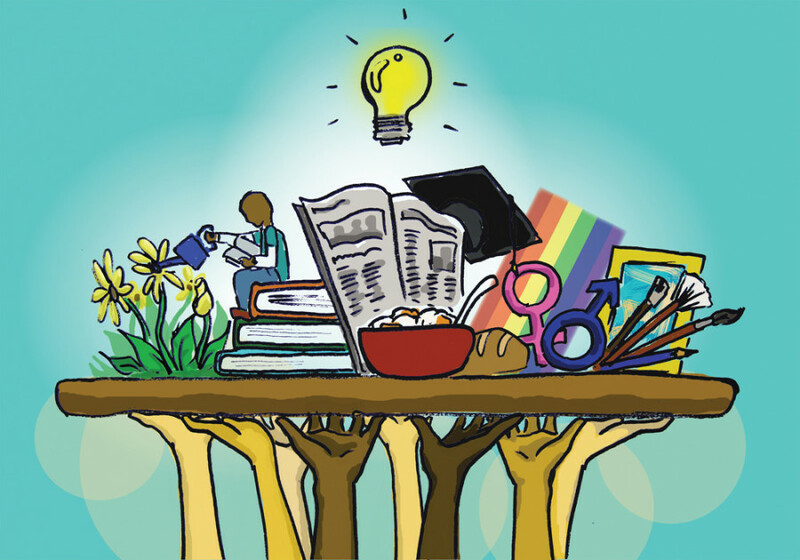 Fee levy groups also provide benefits to all students outside of the diverse services, events and campaigns they already offer in the way of volunteer, internship, job and mentorship opportunities. Participation in a fee levy group means hands-on experience in running a not-for-profit corporation, which is an immensely valuable experience for any student to have. Beyond the classroom, but still on campus, there are so many niches and spaces for students, along with community members, to thrive within a fee levy group. For decades, they’ve provided tens of thousands of students with incredible life experiences that they carry into their future volunteer and career work. Supporting fee levy groups—which means opposing per-faculty referendums—is about a more fundamental debate about what kind of community we want at Concordia. In any community we might not use all of the services that we help support; not everyone listens to CJLO, will volunteer abroad with CVAP, or—to use an example outside of fee-levy groups—will go to a Stingers game. We should still support these groups and services because they’re valuable to other members of the community and enrich us all together. This is a more well-rounded and valuable idea of community than the one that reduces students to self-interested consumers. Lucinda Marshall-Kiparissis is the executive secretary of the School of Community and Public Affairs Student Association and an employee of CJLO. Marc Richard is a former employee of Sustainable Concordia and a student in Accountancy.